Flavasum is following up its research below with an evaluation of the impact of screening Devastating After Effects in secondary schools in London. A similar methodology is being adopted: a pre-screening questionnaire, a post-workshop questionnaire, and we hope a third questionnaire some months later. 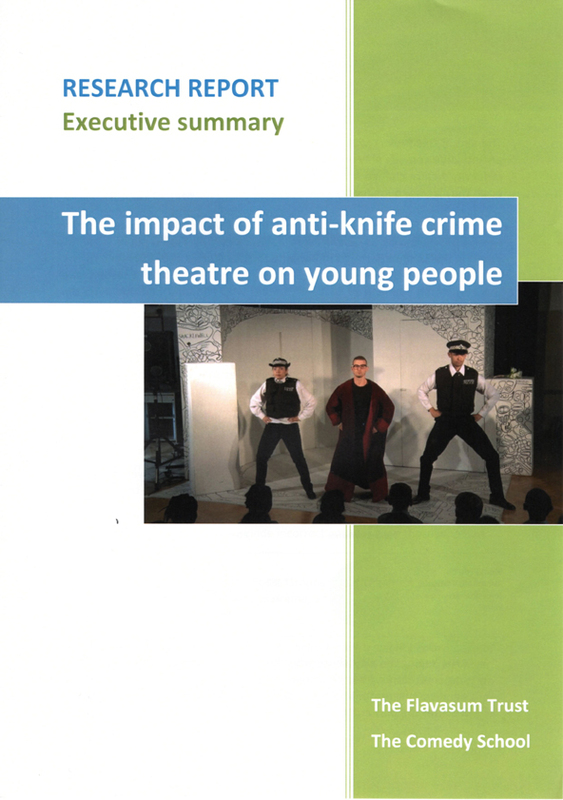 In June 2012 we were able to undertake new research, this time with the help of The Comedy School and the Metropolitan Police in Barnet. “It’s No Joke!” was performed twice a day to groups of Year 6 pupils who were finishing primary school and moving on to secondary school in September. These performances took place as part of Barnet’s Junior Citizen programme. The change from primary to secondary school is a critical period in the lives of young people, exposing them to many new experiences. It is at this time they are most vulnerable to peer pressure, which for some includes the pressure to carry a knife. The research was completed in October 2015 when the full report was published and circulated. For the rresults, please see Impact evaluation, where the Executive Summary can also be downloaded. With the support of Thames Valley Police and Arc Theatre, we arranged to have two questionnaires completed by young people at performances of “Boy X” at schools and PRUs in three towns – Milton Keynes, High Wycombe and Reading. The questionnaires were provided before and after the show in order to evaluate what the impact of the performance was on the young people. It was a pilot for two reasons: (1) because we need to know whether we are asking the right questions, and (2) whether follow-up questionnaires some time later could be completed. The initial questions were based on a US study involving university students who attended one performance by a number of different companies, somewhat different to our pilot. We were unable to have a third questionnaire completed, but results from an analysis of the first two questonnaires provided some useful information about the number and type of questions we should be asking. A short report can be downloaded below.